Whatever your age or flexibility level, you can gain all of the benefits of yoga without the mat. So, whether you’re a senior, struggling with weight control, healing from an injury or facing a specific health condition, this is the perfect class for you. 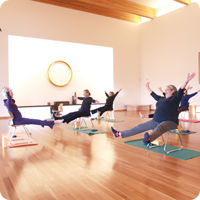 Be inspired in our beautiful meditation hall! Practice yoga (moving meditation) as preparation for sitting meditation. 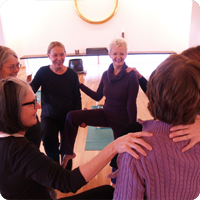 Experience Kripalu, therapeutic, vinyasa, restorative, yoga nidra and more. Learn from different teachers with a wide variety of teaching skills.